A New Restaurant has taken over the old Sisko Space that has been sitting vacant for a good portion of the year. The position of this Restaurant has always been a favorite, while being right in the center of the tourist part it's not overrun with people and the small Plaza Chopin is lined with trees creating a nice relaxing atmosphere. The Chef, Marcel Ress first came to the island by way of Marc Fosh in 2009. Cooking at Simply Fosh as the Sous Chef, and leading the team to a Michelin Star awarded for 2015. This style of cooking remains true when you see the beautiful plates coming out from the kitchen at VÉRD. 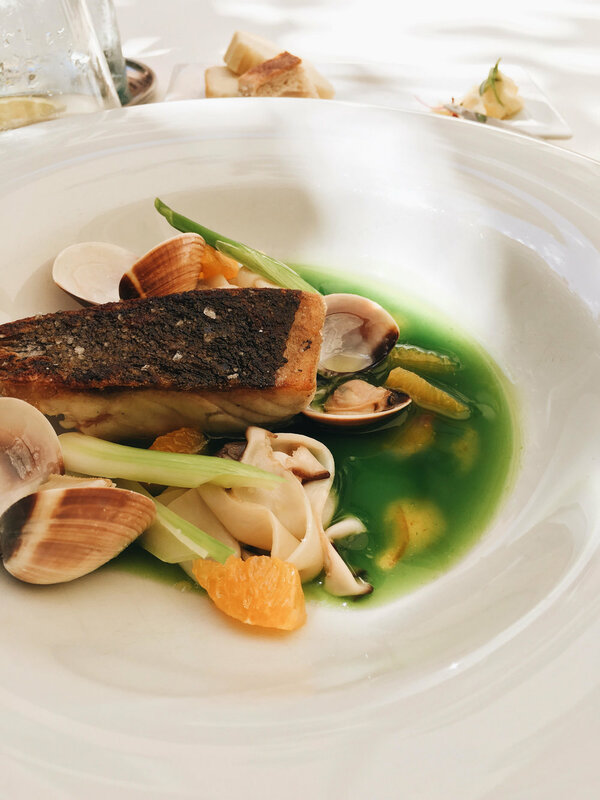 Currently it is only open during lunch hours and calls itself the Summer Terrace of Marcel Ress, we call it our favorite posh lunch splurge. The menu changes regularly as everything is inspired by what is in season and market fresh. The menu is a handwritten chalkboard they place right in front of your nose, which although I understood why it was used I prefer a simple printed piece of paper. I think we can agree that the chalkboard is a bit messy. The menu items don't lend themselves to be easily understood either. I decided to order the Fish dish with chives, bitter orange and clams. I honestly had no idea what would come out and since I'm more of an adventurous eater I was willing to take the risk. I also would have preferred they wrote the type of the fish in Spanish, or when asked they would have just said Corvina. With all of that said, these two dishes were exceptional and the risk turned into a giant reward. 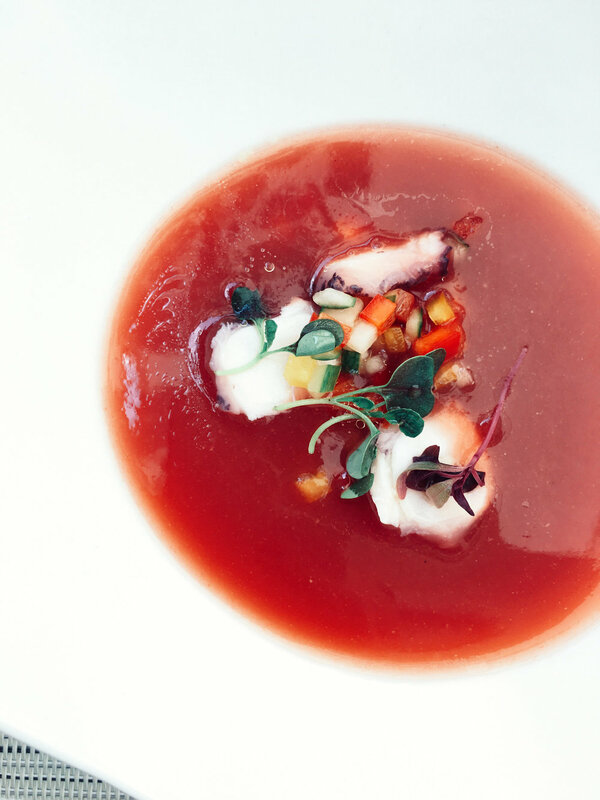 The gazpacho with pulpo (octopus) was refreshing for our hot summer days. The little vegetable cubes gave a nice contrast to the dish and the pulpo was a different touch. But it was the main course that really captured my eyes, and my mouth. The chive description was a light soup they poured table-side (this I continually love to see) the Corvina was cooked to perfection with the crispiest skin. The addition of fresh clams gave a nice brine taste and the pickled mushrooms, were another dimension of their own. I was in awe of the amount of flavors but when put together it wasn't overwhelming and it worked. I was completely full at this point but something told me dessert needed to be ordered. The rhubarb and vanilla ice-cream was the ideal finish. Not too heavy and the mixture of fresh raspberries and rhubarb made a fuchsia color punchy tart soup that worked so well with the white chocolate and vanilla ice-cream. At the moment you don't need to book a table but this will easily become one of Palmas New Favorite Lunch spots. Our lunch for one person including water (which is free) was 32.00euro. We'd gladly pay that over and over again!